I thought I was prepared for Toronto. I had followed the program to a T, and my pre-race routine went exactly as I had planned. The night before, as I had done for every race previously, I had carb loaded, this time at the Team Fox pasta dinner.Then, after a fairly restful night, I rose early to eat my usual pre-race breakfast of a protein bar and a banana and began hydrating. I went through my usual stretches. I ran a quick lap around Alexandra Park, then I walked the mile from the hotel to the start line. I stretched again, peed, ran a little more and finally took my place in my corral. I was ready–not overconfident, not nervous, just ready. Everything was going as I had planned and envisioned it, and as I crossed the start line, I decided that a marathon-running friend, who had told me before I left that “You do not run your first marathon. You survive it,” was full of it. The first few miles went by smoothly enough. The early morning drizzle stopped and the temperature moderated perfectly, which lifted everyone’s spirits immensely. I found a good, comfortable pace and hit my first few splits right on time. I was high-fiving cheerleaders and devil-horning spectators, determined to enjoy every last minute of the day. But all the while, I was trying to keep myself in check, reminding myself that I was in this for the long haul. After a lengthy stretch running east away from the city, the course doubled back on itself, and I took in the inspiring views of the Toronto skyline and Lake Ontario. This, I thought to myself, is EXACTLY what I was hoping for. And with a little encouragement from Stephanie Paddock and the folks from Team Fox at 19K, I was beginning to feel really good about things. Running comfortably in the early stages of a marathon, I learned later, does funny things to a rational mind. At this point, my brain began to override my body. My splits had been speeding up, I knew, but I had trained hard … I was peaking at the right moment … I still had plenty of running in me. So why wouldn’t I be able to run the second half of the race at this pace or just slightly under? Why, my delusional brain started to argue, was a 4:20 finish out of the question? Anyone who has ever run a marathon will, of course, recognize my feelings and know what was about to happen. I had gone out way too fast. Looking back at my splits later, I realized that I had practically sprinted the first half of the course. And even though I had been timing them, I had done a good job of fooling myself into thinking that my pace could continue. I had studied the course map a lot in the weeks prior to the race, and I knew that the next 10 km were going to be difficult mentally. The Port Lands, as I correctly anticipated, were deserted that Sunday morning: no crowds cheering you on, no inspiring scenery, just industrial buildings and chain link fences. Somewhere around 28K, I finally stopped running and walked for a little while. My body had capitulated, but my brain had yet to acknowledge that fact. Less than 5K later, the wheels finally came off. With fatigue really starting to set in, somewhere in the Kew Gardens neighborhood a sniper shot out my left knee–or so it felt. In fact, the stretch of road we were on was heavily cambered: the whole pavement sloped to my left and there was no crown. It was, I later learned, my iliotibial band, a piece of connective tissue on the outside of the knee that had become inflamed by the change in my gait that the uneven angle of the road had produced. Now I was in real trouble, and I knew it. The ITBS injury on my left knee affected my gait so much that I was now running in a way completely unfamiliar to my body. And energy continued to leave my body like air slowly leaving a balloon. “You do not run your first marathon. You survive it.” The words haunted me over the final 10K of the race. Fortunately, as the course entered The Beaches neighborhood, the crowds picked up and temporarily lifted my deteriorating body and spirit. Someone from the local fire department ran alongside me for a few hundred meters, shouting encouragement and urging me on. 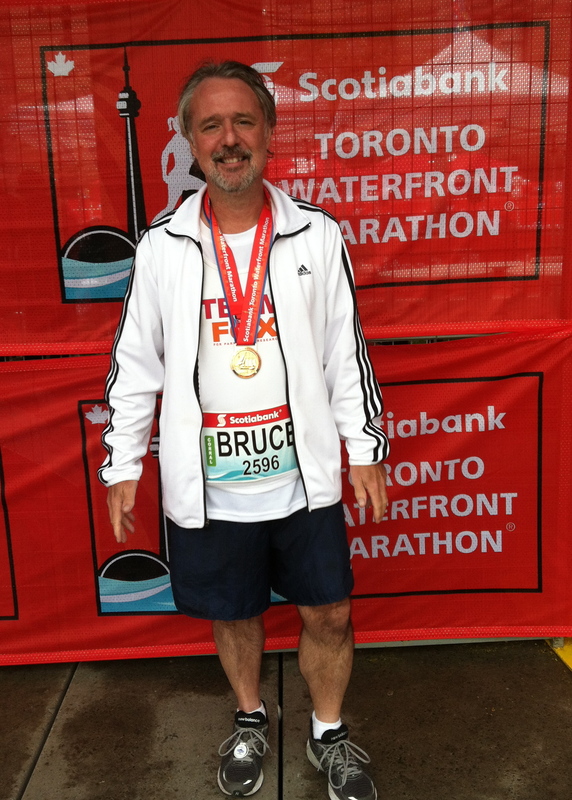 Strangers saw my name on my bib (one of the great little touches added by the Toronto race organizers) and yelled out “Go Bruce!” I cannot thank them enough, as they seemed to the only thing keeping me going, especially when the course turned 180 degrees at Beech Avenue and we began to head back west toward downtown Toronto. The view of the city skyline at that point was both inspiring and daunting. I was so near and yet so far. I was Dorothy, viewing the Emerald City with a whole field of poppies still left to run though. The last 5K of the race remain a blur. I walked. I hobbled. I attempted to run. I walked again. As we crossed the Don Valley Parkway and entered the city limits, I found my last remaining ounces of energy. At the final turn onto Bay Street, I broke into a trot and ran to the finish line, pumping my arms in the air like I had just won Olympic Gold. I had been on the course for 4 hours and 56 minutes, a far cry from my target of 4:30 and an even farther cry from the delusional 4:20 I had dreamed earlier in the day. I smiled. I just didn’t have the heart to tell him how much sweat, pain and mental anguish such “necklaces” cost. This entry was posted in The Flat-Footed Fox and tagged long-distance running, Michael J. 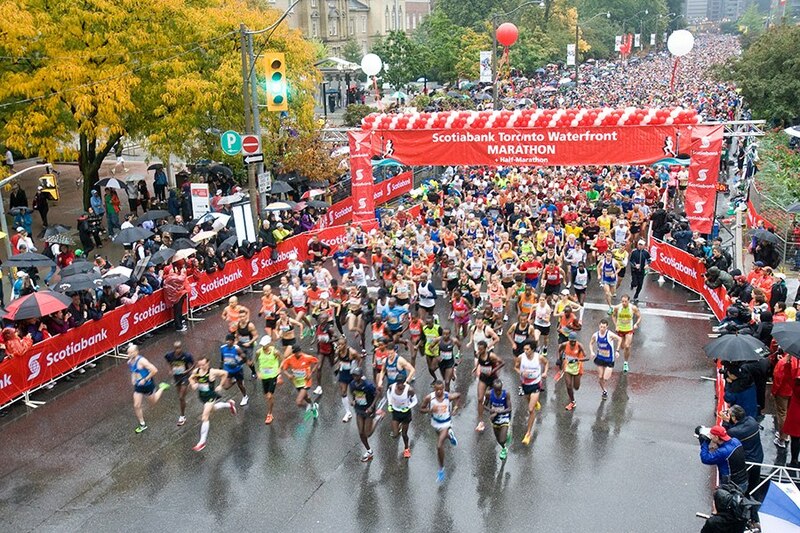 Fox Foundation, Toronto Waterfront Marathon. Bookmark the permalink.